Line 7 (brown L7) Barcelona Metro. Updated 2019. 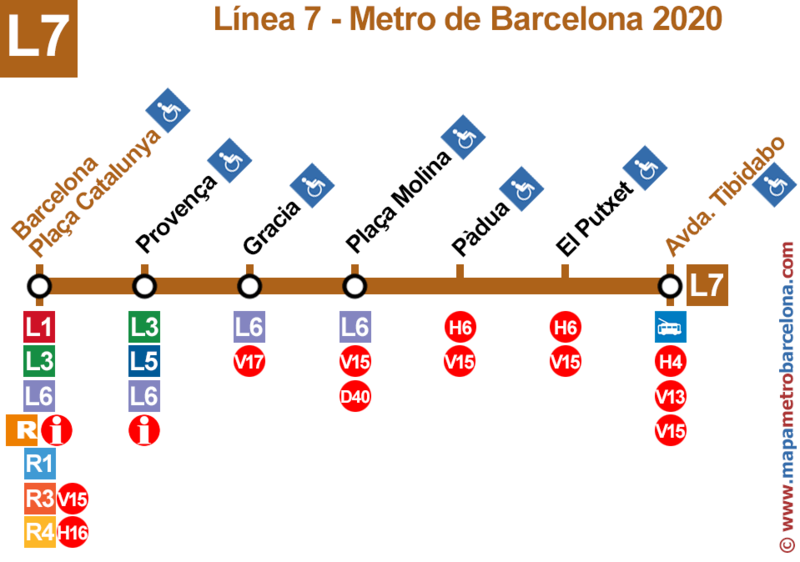 On this website we have the best map of line 7 of the Barcelona Metro (brown line), the most complete and updated Internet. We have MapaMetroBarcelona.com designed to make life easier for travelers to our city subway. This is the list of all metro stations of line 7 (brown line). Next to the name of the stop, we've added if you can make a transfer to other transport. Barcelona - Plaça Catalunya (transshipment: metro L1, metro L3, metro L6, Tren Regional R1, Tren Regional R3, Tren Regional R4). Provença (transshipment: metro L3, metro L5, metro L6). Plaça Molina (transshipment: metro L6). Avinguda Tibidabo (transshipment: tram blau). Thank you very much for your visit, we hope that our Barcelona Metro Map line 7 has been useful to you.